Monday, June 2 is Yom Yerushalayim, also known as Jerusalem Day - the anniversary of the reunification of Jerusalem where Jews were denied access to their Holiest city from 1948-1967. Yom Yerushalayim is a holiday celebrating the reunification of the Jewish Holy City of Jerusalem in the hands of its rightful owners, the Jewish people. In 1948, no Palestinian state was invaded or destroyed to make way for the establishment of Israel. From biblical times, when this territory was the state of the Jews, to its occupation by the British army at the end of World War I, Palestine never existed as a distinct political entity. In May 1948, Jordan invaded the eastern part of Jerusalem, drove out all Jews from the Old City and divided the city. A wall was erected dividing Jordanian-occupied east Jerusalem from Israeli west Jerusalem. The eastern side of Jerusalem held the Temple Mount, the Western Wall, ancient synagogues and other Jewish holy sites. In violation of the 1949 Armistice Agreement, Jordan denied Israelis access to the Temple Wall and to the cemetery on the Mount of Olives, where Jews have been burying their dead for 2,500 years. Jordan actually went further and desecrated Jewish holy places. King Hussein permitted the construction of a road to the Intercontinental Hotel across the Mount of Olives cemetery. Hundreds of Jewish graves were destroyed by a highway that could have easily been built elsewhere. The gravestones, honoring the memory of rabbis and sages, were used by the engineer corps of the Jordanian Arab Legion as pavement and latrines in army camps. The ancient Jewish Quarter of the Old City was ravaged, 58 Jerusalem synagogues - some centuries old - were destroyed or ruined, others were turned into stables and chicken coops. Slum dwellings were built abutting the Western Wall. For 19 years, from the founding of the State of Israel in 1948 until the Six Day War in 1967, Jerusalem was a city divided by barbed wire and dangerous "no-man’s land" running roughly north to south separating the Jewish people from the Old City of Jerusalem. The Old City, the City of David, was the cornerstone of 2,000 years of Jewish longing for Zion. The long-held dream of Jewish sovereignty in the Land of Israel was finally achieved, but the heart of the land was at once visibly close and miles away. When Israel was born in 1948, its citizens and armed forces were unable to defend the Old City, and it fell to the Jordanian Legion. Jews were cut off from their holiest sites in Jerusalem, including the Kotel (Western Wall), the City of David just outside the Old City Walls, Mt. Scopus and the ancient Mount of Olives cemetery. Throughout this time the Jewish character of the Old City was systematically destroyed by the Jordanian government. Thousands of Jewish residents of east Jerusalem and the Old City were driven from their homes. Fifty-eight Jerusalem synagogues, including some that were hundreds of years old, were destroyed or ruined and others were turned into barns for animals or public bathrooms. The entire Jewish Quarter was destroyed, houses were built immediately adjacent to the Kotel and all access to the ancient city was completely denied to Jews. Then suddenly, in the middle of the Six Day War, Israel found itself, unexpectedly, in control of the Old City. With the news that Israel had taken control of the Old City and east Jerusalem, Israelis from all over the country began flocking to the Kotel to celebrate their young country’s miraculous victory. With Israeli sovereignty in all of Jerusalem, the holy sites of the world’s three great monotheistic faiths were opened to all, as they had never been under centuries of Muslim rule. Once called the "Wailing Wall", the Western Wall of the Temple Mount is referred to in Hebrew as the "Kotel", the "Wall." The Western Wall Plaza has been opened since 1967 to all people as a place of prayer and study. On the right side of the women's area of Western Wall Plaza is Barclay's Gate, named for an American tourist who "found" it in 1848. 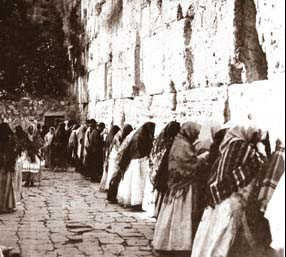 Here is a picture of Jewish women praying at the Western Wall in 1848 during the reign of the Ottoman Turks. One cannot deny the history, the beauty, the radiant spirituality of the Jewish Holy City of Jerusalem. Not even Muslims.